I want to attack in numbers. How do I get my defenders to join in during attacks? My defene is weak. How cam I pull my strikers back to defend? Barcelona is a great attacking team, but it is prone to counter-attacks. How can I restrain my defenders from joining the attacks? Under Set Pieces, in the ‘Players To Join Attack’, select those defenders to attack. Activate CB Overlap to push defenders up. Avoid using defenders to make forward runs, either by L1 or R2. 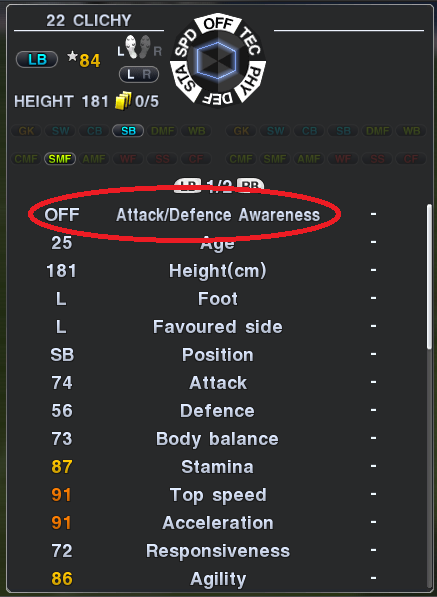 In PES 2010, we have the option of adjusting the awareness level, between Offence, Balance, or Defence. I guess players complained that that was pretty ridiculous, which made Konami removed the feature and made it a special characteristic of each player. The awareness of each player will affect his individual style of play in every match. An Offence awareness will encourage the player to make frequent forward runs, while a Defence setting makes a player stay back. As in the case of Clichy above, he has an OFFENCE Awareness, which makes him an ideal attacking leftback who loves to charge up the field. On the other hand, if you wishes to play with a more defensive formation without an attacking sideback, you may want to play Sagna, who has a Balanced Awareness level. 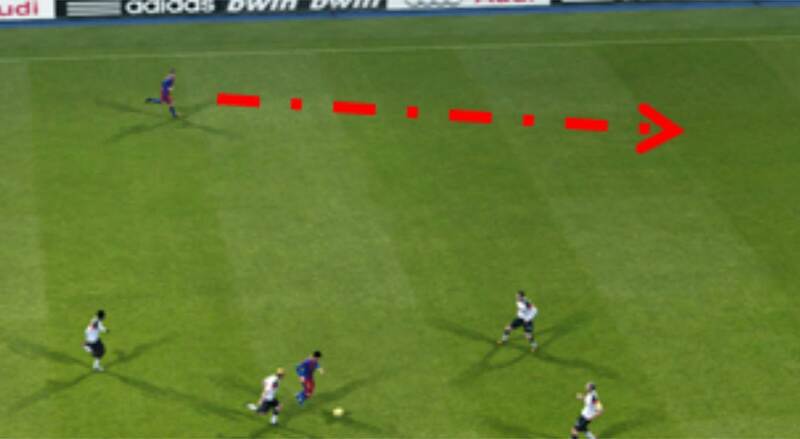 In the case of Barcelona in PES 2011, their default central defenders of Pique and Puyol have an awareness of Neutral, and their sidebacks of Daniel Alves and Maxwell possess Offensive Awareness, pushing both sidebacks to make attacking runs throughout the game. For players who wish to play a more defensive Barcelona, perhaps you guys could play Milito in CB, with a DEF awareness, and Abidal, with BAL awareness, instead of Maxwell. Mascherano (DEF) can replace the default Sergio Busquets (BAL), to add more defensive steel to the whole team. Do not expect strikers to defend. I have done a check on PES 2011 Center Forwards and almost all of them have an OFF Awareness, thus we have to manually control them to make runs back into their own half. A small number of them possess the BAL awareness, however they are not well-known and their ratings are poor, so there is no point in signing them. That isn’t really a big concern since a striker’s job is to attack and score. And after this post, I hope you will have more control over how you want to structure your team. Let me know what you think! 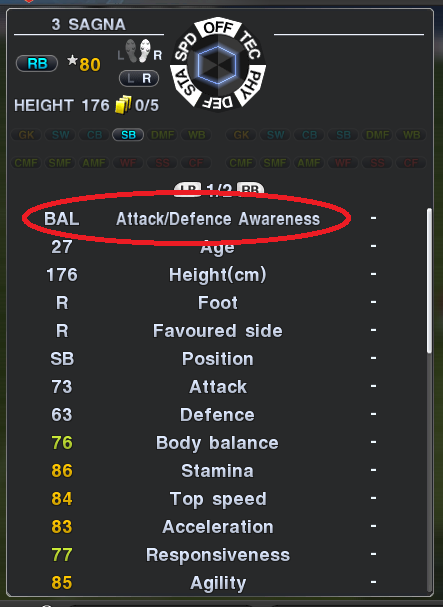 Can you change the awareness settings on each player to suit your own liking (or can it even be done via player edit mode)? 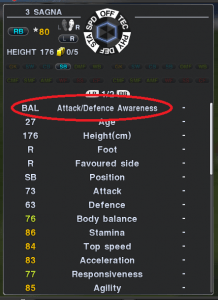 the Attack/Defence awareness is one important point in structuring your team. The “Aggression”-Attribute is another important thing to rate how a player behaves on the pitch. The higher his value is the more the player will join attacks (important for attacking players). 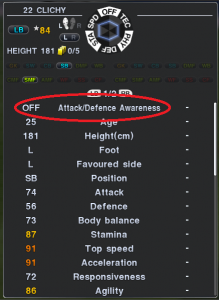 According to to your style of play it ist important to have Defenders / DMF with low aggression, because they will stick to their position better than a player with high aggression. Thats a great piece of advice! Thanks! Thanks for finding this post useful! Hey Neo thanks for your tutorials man i always read with interest, i have two questions for sometime in my head but never really posted to ask anywere about them, well now i think i really want to know about this and maybe someone of you or some of the guys here can point me to the right direction. Here we go…. 1.Im curious about the player boots( the original default boots that come with the player from konami not patched or edited ones). They all have specific stat boosts for players , some have speed qualities , other passing qualities and so on , what i dont know is if those boots add on to the default player attributes or not. for example if a player has 82 shooting accuracy and he is wearing a boots that boosts shooting will the shooting accurcay increase more than his 82 default stat ? or its something that works only offline with the BAL mode ? Does it work in master league online ? 2.My other question is about the short pass and long pass attibutes . Does the short pass mean low groung razor passes and the long pass for high passing off the ground? or its purely related to the distance from were the passer is and the reciever stands ? For example if if player A passes to player B a low ground pass that never leaves the ground but the distance is far, will the game engine calculate the long pass accuracy and long pass speed? I could ask the same about a short distance pass which go off the ground as in a lob pass , will short pass accuracy and short pass speed be calculated or the long one ? What i want to know is if the short pass stats take place when the ball never leaves ground while the long pass stats come in when the ball leaves the turf (short pass stats for low passes while long pass stats for high passes), cause i kind of always had that impression but now im in doubt. I apologise for the late reply. Thanks for the interesting questions! In my opinion, I believe that the boots your players are wearing will improve the stats of the players. I think that is why most strikers in PES 2011 wears the pink nike boots by default, as it allows them to shoot better. I think this works in ML offline. I am not sure about online though, but whichever the case, i think the improvement is minimal. Regarding the long and short passes, I have the same assumption as you. Short = ground passes, long = high passes. I did not really give much thought to it until you asked! These are my opinions. Would love it if any readers would comment if you guys have any ideas?